This rich and creamy chocolate hazelnut fudge is full of hazelnut flavor thanks to the addition of hazelnut butter! Paleo-friendly, vegan and gluten-free. My last two fudge recipes weren’t exactly fudge. They were fudge-like candy. 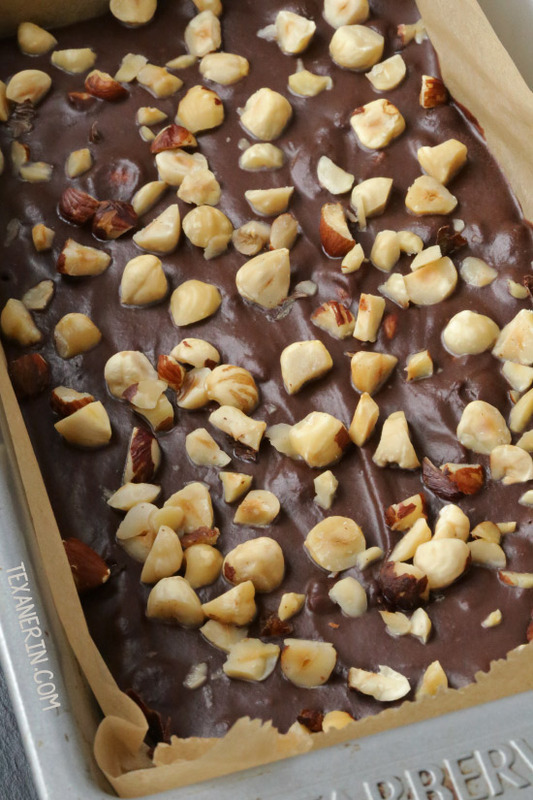 This chocolate hazelnut fudge recipe, though, is for real fudge. And I’d consider it a little healthier than your typical fudge! There’s no sweetened condensed milk, marshmallow fluff, or any such stuff in here. To make your own hazelnut butter, process 1 1/2 cups (165 grams) toasted and preferably blanched hazelnuts in a Blendtec or a food processor. Process until creamy and smooth like natural peanut butter. You don’t actually need that much nut butter for this recipe but I find it difficult to process smaller amounts than that. If you don’t want to eat the leftover hazelnut butter plain, you could use it in these hazelnut cookies or this homemade chocolate hazelnut butter. If you use a food processor, the hazelnut butter won’t be totally without any tiny bits of hazelnuts (and therefore neither will your fudge). If you use a Blendtec, it’ll be just as smooth as store-bought. So if you have the option, definitely go with that! Both ways are delicious so if you don’t have a Blendtec, don’t let that hold you back. And unlike my last fudge recipe (this peanut butter fudge), you don’t have to boil anything. You just melt everything together! You could even make this in the microwave if you wanted. I haven’t tried this with any other nut butters or cream instead of coconut milk but if you feel like experimenting, let me know how it goes. :) By the way, you can’t taste the coconut milk at all. All you taste is chocolate and hazelnut. I cut this fudge straight out of the refrigerator assuming it’d be melty at room temperature. But I was wrong. It’s firm just like traditional fudge is at room temperature. And it’s easier to cut at room temperature than when cold! If you’ve made paleo or vegan fudge before, then you probably know it often melts at room temperature due to the coconut oil. Like this chocolate peanut butter fudge – it’s super delicious but has to be chilled. If you’re like me and love the chocolate hazelnut combination, try these gluten-free chocolate hazelnut muffins from Flippin’ Delicious! In a large saucepan, mix everything, except for the hazelnuts, together. Melt over low heat while frequently stirring. Meanwhile, prepare a 9"x5" loaf pan with a piece of parchment paper. Once the mixture is melted, add 3/4 cup chopped hazelnuts, if using. Pour the fudge into the prepared pan. Let sit for about 20 minutes and then sprinkle the remaining 1/4 cup chopped hazelnuts over the top of the fudge. Refrigerate for 2 hours or until set. You can cut this when cold but it's easier when at room temperature. Store at room temperature for 1 day and then refrigerate. It'd likely stay well for much longer than 1 day at room temperature but I figure I'd better stay on the safe side and say 1 day due to the hazelnut butter. Use these chocolate chips for paleo / vegan / dairy-free. See the post for directions on how you can make your own hazelnut butter. To toast hazelnuts, place on a baking tray and bake at 350 °F (165 °C) for about 5-8 minutes or until they smell toasty. Shake the pan halfway through. Let cool for 5 minutes and then place the nuts in the middle of a clean tea towel and rubs off the skin. Discard the skin. You could alternatively toast them in a pan on the stove top. 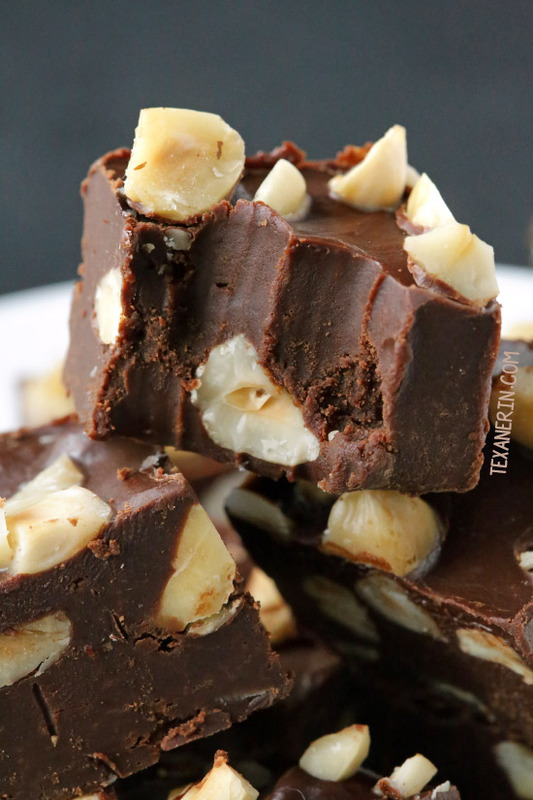 75 comments on “Chocolate Hazelnut Fudge (paleo, vegan)” — Add one! If we buy those recommended choc chips from Amazon, will you receive some sort of commission rate by having an affiliate link? I’m just curious because if so this is helping you out and that’s a great thing. I am also looking out how to do this affiliate link thing to Amazon to gain some extra and well needed money. I made this with sunflower butter and made it just plain chocolate. It was exactly like REAL fudge! I’m making them for a Christmas party and I’ll be doing sun butter again and adding peppermint extract. Also a double batch so I can keep some for myself! I make this for my vegan family and we love it. I use walnuts sometimes. Also chocolate hazelnut butter. Thanks for sharing.this fudge will be my Christmas gifts this year. Could this be made with almond butter instead of hazelnut butter? You have blown my mind with this one! This has been moved to the very top of my ‘Get In My Belly’ list. From one very happy chocolate hazelnut lover, thank you!! This recipe doesn’t yield much fudge so you I think you’d only need the seeds from 1/4 or even 1/8 vanilla pod. You can add more to taste if it’s not enough! I think honey would work fine but I haven’t tried it so I can’t guarantee it. But they’re both liquid so I’m hopeful. :) I hope you’ll enjoy it! Don’t be sorry for not commenting! I only comment a few times a year so really… ;) And thanks so much for your nice comment! This sounds scrumptious! I love the hazelnut butter you create to make it too. Haha. So happy to hear that! :) And I’m the same. I have to have fudge if we come by a fudge shop! Mmmmm, I just want to reach in and pinch a piece off! Such a good fudge recipe! I love the hazelnuts mixed into it. Oh gosh…AND hazelnut butter? I’d be in heaven! Interesting! I never put much thought into “real” fudge – fudge-like treats I simply call “fudge” haha! I love the sound of this Chocolate Hazelnut Fudge. I’m off nuts for the time being but would love to try this recipe as soon as I can!! I love a rich and flavorful fudge this time of year. I can’t wait to try it! Yeah, my Blendtec gets my nutella super smooth too! This fudge looks to die for. Isn’t it amazing?! It makes such a huge difference. Fudge made without sweetened condensed milk or marshmallow fluff? Woo-hoo!! I pinned this to so many boards the other day – it looks so incredible. I’ve already added it to my holiday “baking” list! I’ve never made hazelnut butter before but I love hazelnuts. I really need to make it, and this fudge. It looks so rich a chocolaty. I just love all those chopped, toasted hazelnuts you’ve mixed in too. Creamy and crunchy. Two of my favorite things! It’s still got plenty of calories but at least it’s not full of weird stuff. ;) At least that’s what I’m telling myself! This is a treat that is a problem for me. I’m not even the craziest chocolate lover, but homemade fudge is hard to resist. I would have to give this away as soon as I would make it, because I wouldn’t eat just one piece!! ha!!! This is MY kind of fudge! You made some perfect slices too. I love the ingredients! You are enabling me in the most delicious way! I very much want a piece or ten of this fudge! So rich and delish! My oh my. I love fudge, It’s probably the one sweet treat I miss most…well I still get some, just a few tiny bites here and there, vs an entire batch. This looks absolutely wonderful. I love hazelnuts and chocolate together; it has such a ‘grown up’ flavour! I guess it does, doesn’t it?! I never thought about that before. Love what an easy recipe this is for fudge. Definitely an easy one to whip up and pass out as gifts for some friends! 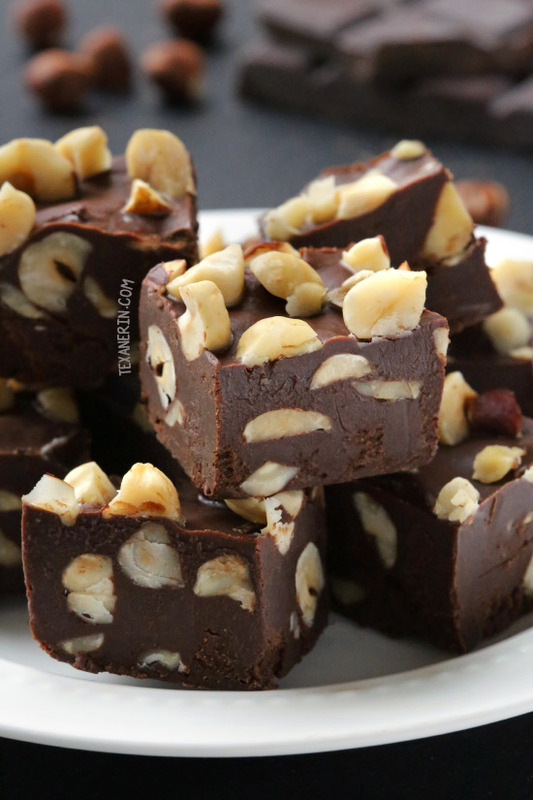 Chocolate and hazelnut is basically the best combo everrrr I’ve got to make this fudge!!! One of my all time favorite fudges. Thanks. These are so tempting! You’ll never go wrong with chocolate and hazelnut! Love this combo!YUM YUM! I’ve never made fudge or any other candy except peanut butter balls. Just never been into making candy. Looks delicious though. Beautiful, what a great gift for the holidays! This is the perfect treat to bring to work. Thanks! YES, this looks absolutely incredible! I seriously have to make this! I adore hazelnuts! They remind me so much of my home in Europe – hazelnuts are a staple in baking over there and they impart the best flavor. This fudge looks amazing!